Today, in this modern era, male and female both are working side by side in different sectors like coaching, consulting, entrepreneurship, etc. And, we know that as a woman, it’s so hard to make her voice to stand out from the background noise. Likewise, it also harder to find out the perfect tools to spread ideas, opinions, and services online in the right way for a wider audience. 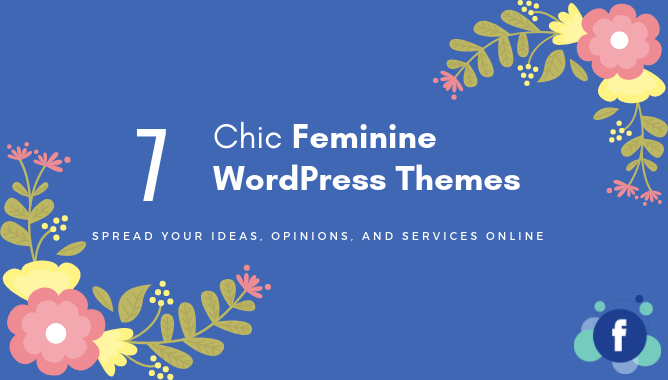 So, for those women like you who’re looking for the exact solution to spread-out their personal potential ideas and opinions through online coaching and consulting, here we’ve curated 7 chic Feminine WordPress themes for your website. Just dive into it, definitely, you’ll find the right theme with lovely feminine website design to build your own professional website whether you are working as a life or health coach, marriage counselor, or business consultant. The process of making a website is super easy using these themes with WordPress, you don’t need any special coding or programming skill. However, you can hire a professional Web developer to do that if you want. Let’s kick this list with Motivate, that’s one of the most wonderfully designed feminine WordPress themes for coaches, consultants & entrepreneurs. It includes drag & drop page builder, front-end live customizer, and all the essential features & elegant styling elements you ever need to create your own professional coach website easily and quickly within minutes without any coding skill. Our second pick is Inka, a minimal blogging WordPress theme that’s built with the best coding practices in mind to make it easier to create great looking traveling websites, fashion sites, or lifestyles blogs in no time. With its live customizer, you can easily change & modify font styles, colors, featured slider, social profiles, etc. As well as, it also allows you to connect and show your Instagram feed directly. Moreover, less pricey than other premium feminine WordPress themes on this list. Tribe Coach is one of the popular feminine WordPress themes for female entrepreneurs that was carefully crafted from the scratch to allow you to build your own professional coach website easily and quickly without touching a single line of code. It has almost everything you need from elegant design to social media buttons, opt-in forms to banner blocks so you can grow your audience, catch more leads, and promote your products and services easily. Portada is an easy-to-use, light and elegant blogging feminine WordPress theme perfectly suitable for female entrepreneurs, book lovers, lifestyle & fashion bloggers, and a business or personal. With multiple blog layouts, beautiful blog post slider, different post formats, numerous widgets, Woocommerce functionality, and powerful theme styling panel, the Portada is undoubtedly one of the best WordPress themes for blogs of any type. Charvi is a pretty WordPress theme especially designed and optimized for all types of girly websites including consulting and coaching business websites. It includes live customizer, drag & drop page builder, and other excellent features and pre-made web elements that allow you to create a clean, modern and crisp designed unique website in no time. Moreover, so easy to use and equally suitable for all types of users, even the users with zero programming skill. Batavia is a beautiful, clean, fresh, minimal and fully responsive WordPress theme that’s nicely suitable for all kinds of personal blogs, consulting and coaching websites. With great typography, smooth animation & transitions, and other easy to use powerful features it allows you to create an exceptional website easily without having any coding knowledge. Our last pick is Celeste – an outstanding feminine WordPress theme exclusively designed for life & health coaching, marriage consulting and business consulting. Celeste theme is fully responsive, retina ready, and super easy to use. With four different home pages with loads of other pages and other superb features & customization options. It will help you launch a great looking professional website for your coaching, counseling or consulting business. Child theme ready, WPML & Woocommerce compatible, etc. There are many women out there who’re doing different types of jobs like health & life coaching or consulting, marriage consulting, business consulting, etc. and looking for the right way to spread their knowledge, opinions, and ideas to help others. The above theme suggestions are actually dedicated to them so they can easily understand and create their professional online coaching and consulting website and get more customers. However, we haven’t tested each of the themes above, but according to hours of research and reading users feedback they are all good and nicely suitable for all types of feminine websites. You can pick any o them without a single bit of confusion! Overall, these are the most popular feminine WordPress themes so far to choose from. Hope, this theme suggestions will be helpful for you to choose the right theme to build your own professional online feminine website. Anything if you’ve in mind to know about, feel free to let us know through the comment box or contact us. We’ll be happy to help you anyhow!